Sparkle and Shine: How sweet it is! So today on the news I heard like eighty people trying to predict what the menu would be for the royal wedding and WHAM inspiration for today's blog. Apparently at the royal wedding they are serving boiled fish, quail, starling pie (whatever the heck that is) and of course the ever sophisticated pig in a blanquette.... wow. Well none of that is really striking my fancy and honestly it really just sounds expensive, so as usual I have some fun, cost effective ideas to better suit your personality.... and they are waaaaay cuter than boiled fish... ew. - Holy cupcake batman! This is such an amazing idea! HOW DOES EVERY WEDDING NOT HAVE THIS!!!! I love this idea because it is hands-on and pretty cheap. You could totally do this all by your self. I mean how hard is to bake some naked cupcakes and then pour some sprinkles in a bowl.... I also really like this because you can personalize everything to match your theme or personality. Having a underwater themed wedding? Throw out some swedish fish. Marrying a nerd? Smarties are the way to go! THIS IS THE BEST IDEA EVER!!!!!! - These are pretty common but I love them. Again this is a super cheap option. You can rent the fountain and then you just cut up some different stuff and let people dip. My favorite dippers are strawberries, bananas, and meringue puffs. YUM! Also another fun little thing you can do is use white chocolate and then food coloring to match your wedding colors. 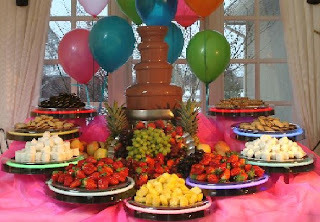 Let's not kid, there is a pink chocolate fountain in my future for sure! - Who doesn't love mac and cheese? This is so perfect because it can please a wide variety of people. 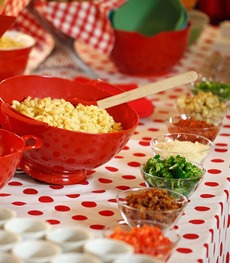 Little kids will like it plain and the grown-ups can jazz up their mac with toppings like bread crumbs, bacon bits, tomatoes, and a billion other things. This can even be dressed up to fit into a more formal wedding. Instead of regular elbow shaped pasta try the little spirals or instead of little bowls dish up the mac and cheese in little martini glasses! - I know, lots of different types of bars, but I don't really care cause they are so darn cute! This is very versatile and cost efficient. You can buy they candy in bulk and its dirt cheap. You don't need servers because you are just putting it in bowls. Also this can double as a party favor. 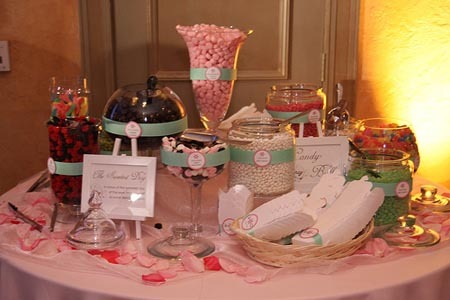 Put little to go bags on the table and your guests can scoop up some candy and take it with them as a favor!!! -I'm not sure why, but put anything on a stick and I pretty much think its adorable... something about all that portability.... 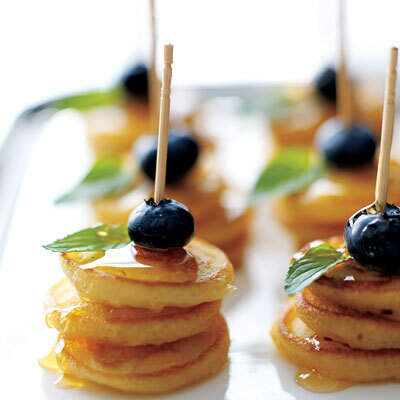 These would be absolutely perfect for a morning wedding when you are serving a brunch type meal after. Pancakes are cheap because there isn't much too them but people are just gonna gush about cute they are! - These are cute and comforting all at the same time. On your wedding day everything is gonna stress you out. every. little. thing. 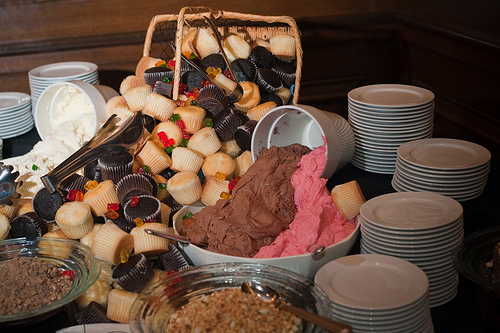 So why not have something at your reception that is just straight up comforting. 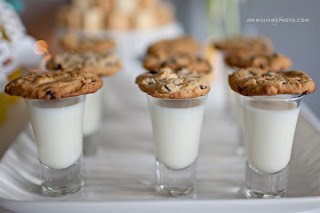 These shooters are way cute and if you wanted you could mix it up with different types of cookies. I personally would just stick chocolate chip because I think it would be beneficial to keep something simple on a day when everything else is soo complicated. I want one of these. Like now. I hope these ideas gave everyone some inspiration, whether it be idea for your wedding... or just what to eat for dinner!